Stainless steel utility carts are perfect in applications where corrosion is a concern. These carts can easily be cleaned and sanitized. 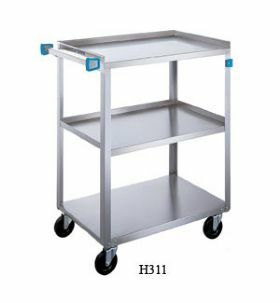 Carts feature electronically welded legs and shelves. Sound deadening panels under the shelves restrict vibration and noise. Bumpers on legs and handles can help protect walls and furniture. Available in 300 lb. and 500 lb. capacity units. FOB Shipping Points. W x L x H Caster Dia. Wt. (lbs.) Price Ea.